He is about to carry the Flag in the closing ceremony at the games. There is talk about putting him on a stamp!! Yeah I heard this morning he was going to be carrying the flag I think it might be too late to stop that. He sure didn't show any pride in our flag at the medal ceremony, that alone should have eliminated him IMO. Well, it's done. Begg-Smith carried the flag as an international ambassador for Australia about 12 hours ago. I wish we could have been behind him all the way, as we are our other athletes. Unfortunately, the suggestions that his company deliberately withheld payments from dozens or even hundreds of publishers (including many Geek/Talkers) and that his wealth has been derived largely through the distribution of malicious software and spyware, makes it impossible for many Aussies to hold him up as a hero of the slopes. Press attention about Dale's business dealings seems to have died down here to a degree. This is again perhaps due to the difficulties that our journalists have not only in understanding exactly what these allegations represent, but in conveying these issues to the public in a meaningful manner. I think it's safe to reveal now that I was in contact with a representative from this country's leading prime-time current affairs program, and a journalist from the country's largest circulation daily newspaper shortly after starting this thread. Both expressed a great deal of interest in the story, particularly the newspaper journo who contacted me immediately after becoming a member here. Both, however, seem to have found it difficult to locate Aussie victims to substantiate the claims and to showcase in soundbytes and quote grabs. That may be a good sign, suggesting that not many Aussies were victims. On the other hand, it might just be an indicator of how difficult it is for computer users to determine the source of any spyware that has infiltrated their systems or to identify those who have been complicit in stealing their personal data and invading their privacy. I'm not an expert in the anti-spyware field so I'm not 100% confident in stating that Dale was directly responsible for the distribution of this dangerous and malicious software; along with all that that entails. Dale's own comments on this board, coupled with evidence provided by those who are experts in this field, don't paint a pretty picture of the situation, however. When that is viewed alongside the fly-by-night nature of the AdsCPM ad network, which attracted more than its fair share of complaint threads on Geek/Talk, and Dale's evasive and contradictory descriptions of his business activities, it's hard to see why this story didn't break more dramatically in this nation. I have heard that a writer for another major Aussie paper has been in contact with another contributor to this thread in relation to publishing a follow-up article about the situation. That may trigger a second round of attention. If not, hopefully this event did at least stimulate enough interest in the highly spyware/botnet scene to encourage popular writers to help inform the public about the dangers that these networks represent. You ALL did great with the research. A scaled-down version was also published on page 3 of both The Sydney Morning Herald and The Age newspaper in Melbourne. Round 3 for his buddy. Many of the articles on Begg-Smith quote his lifleong friend named Andrew Forin. Forin defends him and praises him in glowing terms. Both his athletic ability and his business accume. Just after the last 2 stories broke (which I posted) another investigator exstroidianre has a lot to say about Forin. Exstract: "What's more, Forin is a pop-up spammer, just like his old buddy. In 2004, Forin sent out spams advertising his site, AdVolume.com. In the messages, Forin sought to purchase "US pop up/under or banner traffic." He is in a lot of trouble now, the media have really started to expose him, he owns an apartment in Melbourne, the whole reason he lives in Australia is because of it's "lax" laws, he can pretty much get away wit this, his company doesn't actually riside in Melbourne, he is only a resident, so what can you do, really, has he broken any Australian laws beyond any doubt? I and I suspect anyone else in Oz or with an interest has been furiously e-mailing and 'phoning any contact they had. I suspect DBS has all the hallmarks of a sociopath: no real belief that anything he has done is wrong and no sense of guilt. Manipulative and ruthless in pursuit of his gains. As in many of these cases they get caught out by hubris. Have you noticed how virtually all the web sites and domain names have dissappeared?? Go, go, go web archives!! Although there may not be a will to investigate and or prosecute in Oz if as the news stories suggest there is some interest in NY then something good may come out of this. There would have been an apalling sense of frustation if there had been no mainstream uptake of this guy and his companies. Maybe there will be further follow-ups. Live in hope. Congratulations to all the investigators here and at the other sites. Hey guys, been following this thread, a damn fine read. I think the problem you are going to have in Aus esp regarding to finding people who got spammed or whatever is that most of them don’t really care how or who does it. I work at an ISP and its the usual remark i get is oh well, its something they can easily deal with so no need to kick up too much of a fuss! hehe maybe I just have the best customer ever! Exstract: "...One thing's for certain, Begg-Smith and his spokepersons might try to deny or hide his history, but indisputable evidence remains on the internet viewable by anyone taking the time to find it." "The Begg-Smith (BS for short) issue started with one single post on a relatively small corner of the Internet and spread around the world." Great coverage, Mr "internet vigilante" Shubitz. With a tag like that assigned to you, you sound like the hero of a retro arcade game, Steve. This press coverage has been spectacular in scale. For those of you who aren't familiar with the Aussie press, Sydney Morning Herald is the nation's biggest daily paper. The Dale Begg-Smith story that Steve mentioned above was featured on page 3 of the weekend edition of SMH, which is a very big deal. A lead-in was presented on page 1, associated with the title "Ski champ's online ****s exposed." The local current affairs program that was interested in this story has apparently decided not to run with it, but with the story appearing in the Sydney Morning Herald and The Australian, the country's two biggest papers have been covered. 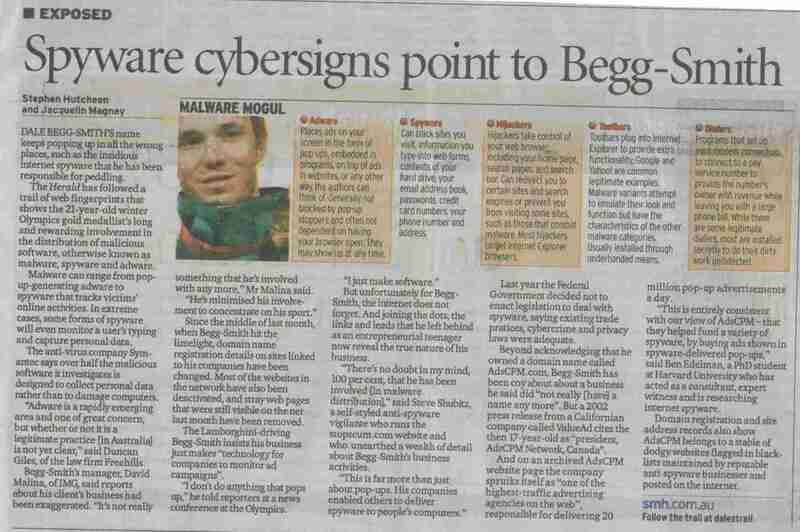 Looking beyond what some see as a vendetta against Begg-Smith, this level of coverage will, at least, bring spyware into the vocabulary of the average internet user in this country. In doing so, hopefully it will help to make net users more security conscious to better equip them against those who would attempt to prey upon the unprepared. There's no doubt also that this level of coverage would have aroused attention from local law enforcement agencies, which might ultimately help to clarify any doubt concerning Begg-Smith's guilt or innocence in relation to these accusations. If he's innocent, that's truly fantastic. Unless our competitors are keen to keep falling over, we Aussies need all the Winter Olympians we can get our hands on. If he's guilty, kudos will have to go to Steve, Ben Edelman and the other cyber sleuths who worked long and hard to uncover the "evidence" that has been leveled against AdsCPM and its related entities.